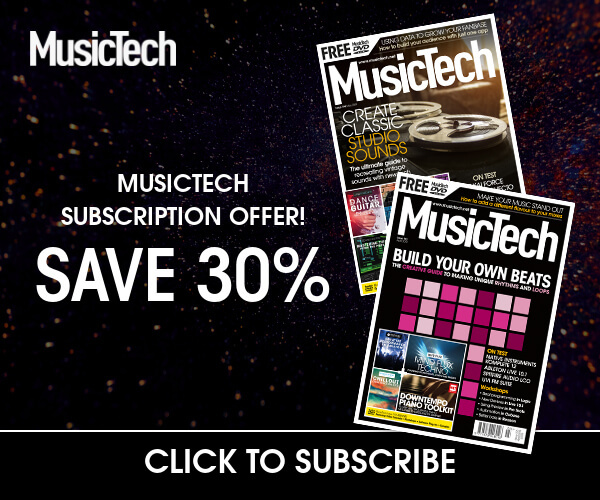 Studio Electronics has old-school credentials – the company has been tinkering around with the innards of synthesisers since the early 80s, revitalising the spirit of products such as the Minimoog via products such as the SE-1. Even when analogue fell out of fashion, SE continued its pursuit of excellence in this realm, leading to a recent collaboration with Roland – the Boutique SE-02. 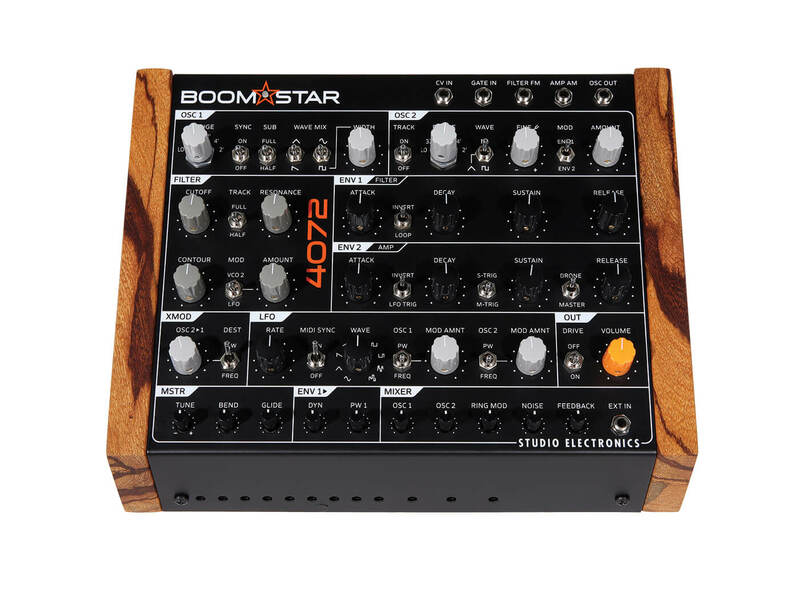 This epic-sounding device came in a pint-sized form factor; however, the reduced footprint made the pots a little fiddly, and that could be reason enough for you to gravitate toward the altogether larger stylings of the Boomstar MKII. The first inescapable impression, upon unpacking, is that the Boomstar is weighty. It’s reassuringly heavy, with a metal fascia fitted with quality pots sporting metal shafts. The beautiful bespoke wooden bookends offer that retro organic feel, but unlike with products from some companies, the wood is drilled from the inside, so you don’t see any screw holes. It’s very stylish indeed, and immediately improves the look of my desk! 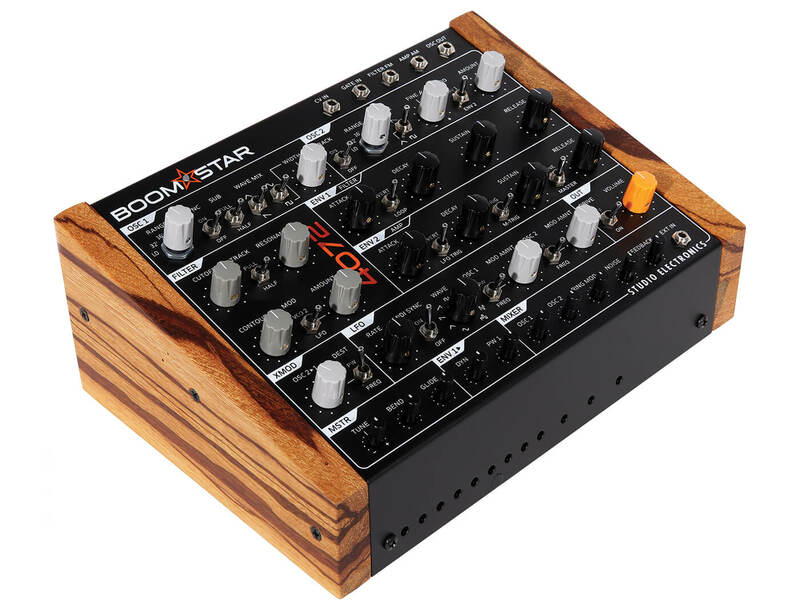 The Boomstar is purely a desktop synth module, measuring 260x180mm – which makes it pretty compact, but not so much so that it feels cramped. It’s available in module form only, which keeps the size tight, and also means you’ll need to provide your own keyboard, though it is equipped with both MIDI I/O and CV/Gate input. A solitary mono audio output on the back is coupled with mini-jack inputs and outputs for external input and oscillator output, while a substantial five-pin outboard power supply keeps any noisy interference out of the Boomstar’s way. There are five iterations of the Boomstar, all of which are identical in every respect, except for one element – the filter. The model names reference each filter chip, so the 5089 Model relates to a Moog 24dB Ladder filter, while the 4072 is drawn from the ARP 2600. 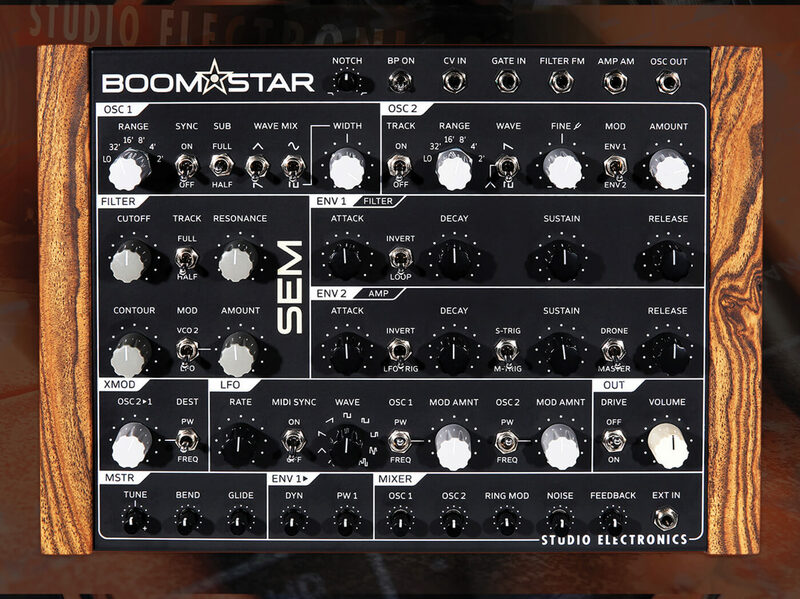 These are classics, one and all – so let’s dive deep into the Boomstar’s signal flow and see what’s on offer. At the front of the signal chain are two VCOs; both oscillators operate over a full range, from 2′ down to 32′, with the ability to switch to low-frequency mode. Beyond this point, the two oscillators separate to offer differing functionality; VCO 1 offers two sets of wave timbre which can be switched in and out or combined. The pairings are triangle and saw, with sine and square/pulse. 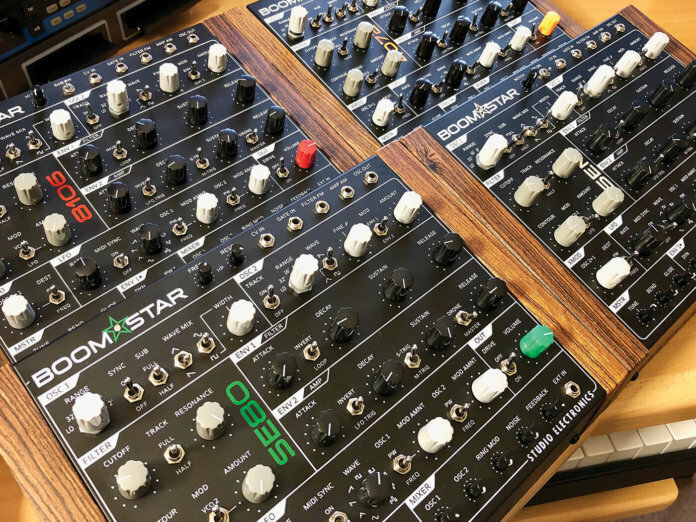 One from each of these pairs can be used, or defeated entirely, meaning that you can just use a single wave or combine, say, the saw with the square – with the latter being open to sweeping pulse-width modulation, either manually or modulated from other areas of the Boomstar. I have plenty of experience with the SE oscillator architecture from the company’s modular offerings, and in this setting, the presence is enormously weighty, even without the onboard sub-oscillator, which is also available as part of the VCO 1. There’s no pot for sub amount, but there is a full and half-signal switch, which will offer the sub in either full-on or reduced guises. VCO 2 offers a similar but different set of criteria, with a straight wave selection between saw, triangle and square. There’s no manual control of VCO 2 pulse width, but modulation is possible via LFO, found elsewhere. VCO 2 can also be set to track the incoming CV/MIDI or remain, drone-like, in stasis; while a fine-tune allows for just the right amount of beating to be set, or more substantial amounts of pitch alteration, if you want to create a tone which is a perfect fifth higher than the fundamental. VCO 2 pitch can also be modulated, via either of the onboard envelopes. It’s difficult to understand on paper why you might get so excited about the Boomstar oscillators, except that the sheer breadth of how these can be exploited is truly beguiling. The output from both oscillators is routed to a small mixer, located at the bottom of the Boomstar, which also offers white noise and ring mod. Turn down the two VCOs and the ring mod can be solo’d and tweaked in all its glory. The oscillators resonate fiercely in this setting, allowing for beautifully gnarly tones to fall from the output. Located immediately next door to the ring mod is feedback, which in turn adds stunning overtones and colour, and unlike some circuits of this kind, does so in a very controlled way. Dial it in, or dial it back: the control is there to pitch it just right. One area where the MKII Boomstars offer clear improvement over the originals is visual workflow. Each of the areas is clearly defined by nice printed lines and clear legends, leaving you in no doubt as to your chosen modulation. Boasting two full ADSR envelope generators, Env 1 is hardwired to the filter, while Env 2 controls the amplitude. There’s an option within the latter section for drone-based use, via flick switches, with comprehensive settings for inversion, LFO triggering, single and multiple triggering – all are flanked by the four ADSR pots, which are full-sized. Env 1 is simpler, offering just inversion and a looping function, which only kicks in once a trigger occurs; at which point, its Serge-like tendencies will start to cycle. The LFO section offers a single oscillator, which is the only element within the Boomstar which falls under internal software control. But don’t be fooled into thinking that this relegates its importance. Apart from the frequency rate, which increases into the audio spectrum, it’s syncable over MIDI to an incoming clock, with a full nine waveshapes. You’d be forgiven for thinking that it would be possible to morph from one wave to the next, due to the sweepable nature of the pot that’s used for selection purposes, but the pot simply aligns with the legend to bring the chosen wave abruptly into play. Once specified, the LFO can be independently sent to Oscillator 1 or 2, to either the frequency of each, or the pulse width of the chosen square wave. This is a considerable coup, because the two oscillators are decoupled – something that comes into sharp focus when used alongside the XMod. This rather simplistic pot, also located in this section, introduces cross modulation from Oscillator 2 to 1. In doing so, any LFO-based modulations can have wonderful and profound effects as a consequence, in the direction of pulse width or frequency. This is a suitable place to draw breath and examine the possibilities here. 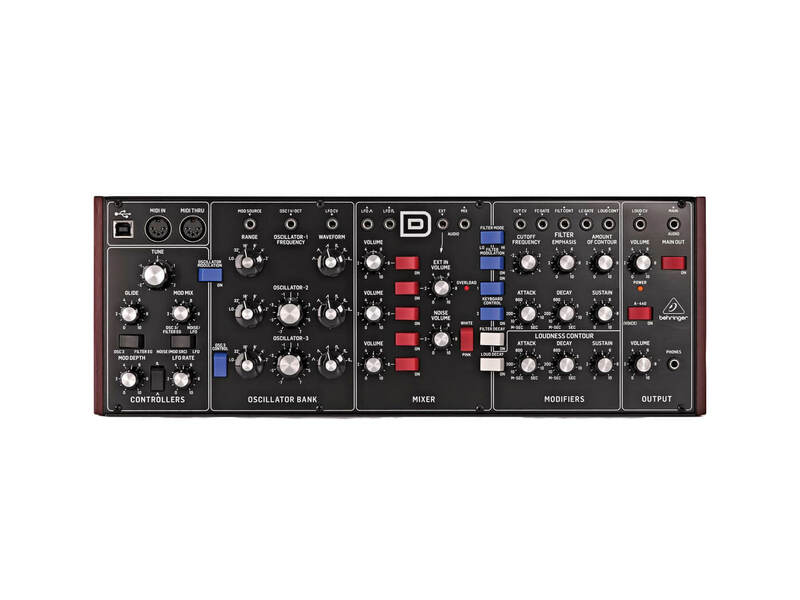 In preparing for this review, I spent plenty of time placing the Boomstar in drone mode to hear what it could do, and I concluded that despite its reasonably small form factor, it’s an absolute powerhouse of synthesis, and very pleasurable to use, too. The combination of VCO level control, coupled with the possibilities in the LFO and XMod departments, means it’s possible to create some exceptionally interesting and organic sounds, but these are accentuated far further when exploited with the ring mod, feedback, and drive on the backend. I constantly found myself using the VCO mixer to remove modulation sources from the audio, leaving the unadulterated, summed signal to be heard in its purest form. Granted, the small pots in this mixer section would be far nicer if increased to the size of the other pots, but it’s funny how you get used to this while you’re knocking up patches. And so to what we might regard as the main event with these desktop monsters – the filters. 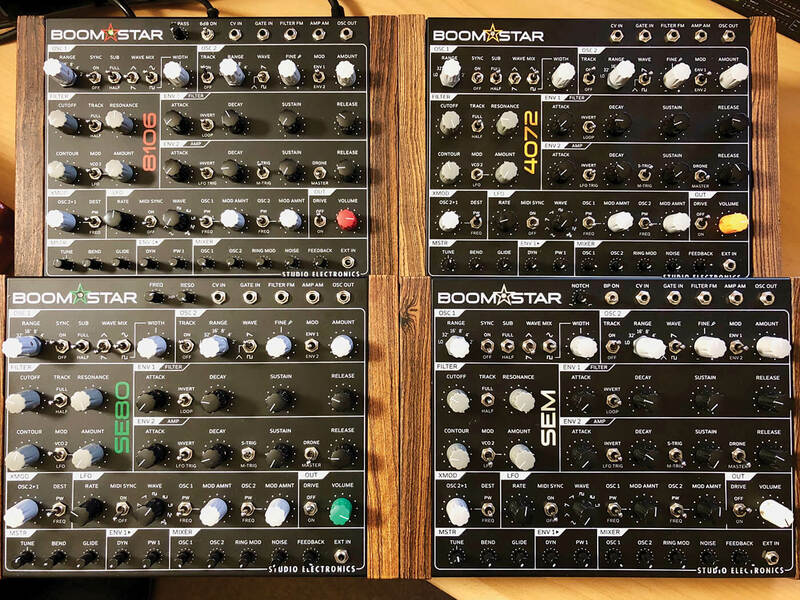 Although the control elements of the Boomstar filter section are essentially identical across the five models, three of them have additional pots and/or switches, to keep them inline with the synth filter being mirrored. The filter section itself is equipped with a cutoff and resonance control, with a tracking switch which can be set to full or half track, or simply switched off. It’s worth noting there’s a filter FM CV input available, too, should you wish to place frequency cutoff under external control. Below these pots is a contour amount pot, which will dictate the amount of envelope control being sent in thisgeneral direction. While using this mode, I particularly enjoyed switching the amp envelope to master, meaning that a single envelope becomes the central event for both amp and filter cutoff – doing this with the Roland-styled Boomstar yields 101-style sounds with great aplomb. There’s also an amount pot for applying LFO or VCO 2 modulation in the filters’ direction, too, should this be required. We’re lucky enough to have four of the five Boomstars available at the time of review, making it very easy to draw some direct comparisons between the various flavours. Beginning with the 4072 model, which is based on the later ARP 2600 filter designs, this model keeps things simple and inline with its vintage predecessor. The 24dB/4-pole design used here is a personal favourite, and regarded as one of the classics, for good reason. Offering plenty of midrange, along with an incredibly beautiful and wispy resonance, it sounds super-smooth in its default state. It’s classic ARP, and not prone to anything like the degree of low-end signal drop which might be attributed to some Ladder filters. Applying some feedback quickly brings the filter into a state of howling, but unlike some untamed filters, this feels innately musical. And while we’re talking musical, the Oberheim-inspired SEM-based filter offers more musicality, but in the legendary OB state of 12dB/2-pole. Here, we also see the first of the additional filter controls (located at the top of the Boomstar) allowing for a blending between the onboard low-pass and additional high-pass/band-pass, as found on the original SEMs. Unlike the original SEMs, however, the Boomstar SEM offers all of the additional functionality previously mentioned, such as four-stage envelopes. You can hear the real crispness of filtration with this one: the option to switch and blend between filter types opens up that glorious throatiness that you only get with two-stage filters of this kind. The SE80 filter, inspired by the Yamaha CS-80, never fails to pleasantly surprise, even though I’ve been a big fan of the Eurorack version of this filter for some years. Two additional pots are in play here, which offer cutoff and resonance for a high-pass filter. Drive these into a frenzy and all sorts of input-frequency-dependent pops and clicks emanate, which duck in and out according to the resonance in the sequence. It adds up to a treasure trove of inspiration. For pure punch, the 8106 Boomstar version, based on the Roland Jupiter/Juno filter, is pretty difficult to beat. Although there’s a degree of low-end drop out with resonance increase, there’s an underlying weight which is difficult to ignore. Being a long-time devotee to the SH-101 cause, I particularly enjoyed this one, as the resonance of the filter screams when placed alongside the feedback and overdrive, yielding some superbly usable sounds that are so reminiscent of the Roland heavyweights. The feedback and overdrive greatly assist in replacing some of the low-end that might otherwise be lost during resonant filtering. So, which to choose? Well, that simply isn’t a question we can answer here, purely because different filter types will appeal to different people, depending on the music you make or listen to. One thing that’s undeniable is they’re all outstanding in their own way. I didn’t so much have a favourite, as zero in on two in particular, with the other two closing in fast; and that’s before we’ve even considered the hitherto unmentioned 5089 Boomstar, which is based on the Moog Ladder filter. However, when it comes to considering one of these desktop beasts, the filter question is clearly the only debate in town, as the breadth and complexity of the oscillators et al is firmly part of all Boomstars. The VCOs sound enormous; place that through an exceptional filter and you’re onto a huge winner. For many, the only other question may be whether the form factor fits into workflow, and having one sat on my desk for a couple of weeks was nothing short of a pleasure. The price is on the high side, but as I discovered, that’s largely down to the cost of the internal components and the build quality, which is excellent. Quality synthesisers sound the way they do because of the internal components, and that’s one thing you’re assured of with a Boomstar MKII. If you love the idea of analogue and vintage gear, but you’re concerned with both the sometimes extremely high price and the understandably unknown reliability issues with some of those vintage machines, the Boomstar MKII range could be a great way to get something that harks toward the sound you want, without the risk. With such a choice, the most difficult decision will be which one from the range you opt to buy. They’re all really great and sound immense, and you’ll feel and hear the quality of the product when compared to other, cheaper products in the market today. Against the great software versions of classics available, they aren’t cheap, but you’re buying into the hardware, and once you get your hands on the pots, you’ll understand why so many people still want hardware synths. Also, given an ARP 2600 could cost upwards of £7,000, you could even regard the Boomstar MKII as something of a bargain. The first of the new resurrections of classic anologue kit from Behringer, the Model D is a well-built and great-sounding Moog clone, which sounds very like the original, but doesn’t fill the same desk space. A bargain. 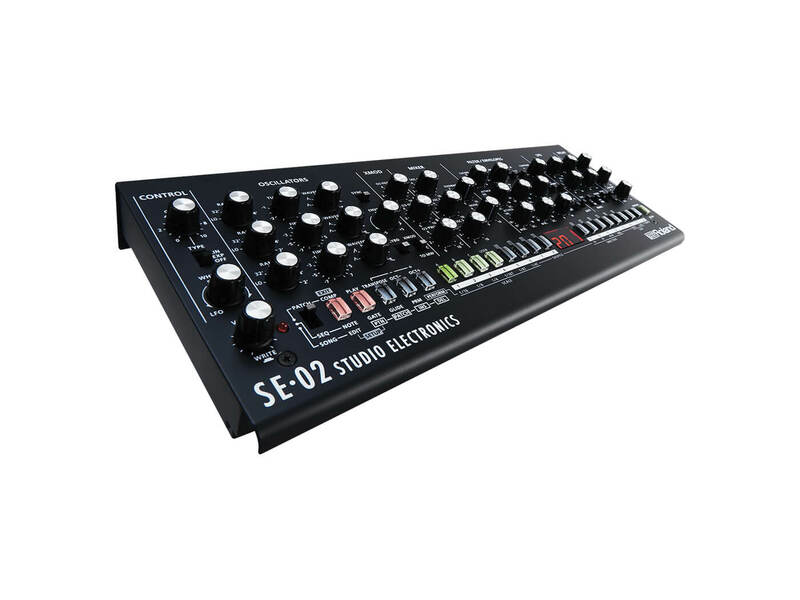 The product of a relationship between Roland and Studio Electronics, the SE-02 delivers very similar routings to the Boomstar, withexcellent X-mod possibilities, but within the Roland Boutique form. These tidy boxes pack the most enormous sonic punch. The Booms really do shake the room!